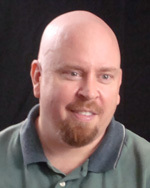 Richard Stein oversees the IT and graphics departments as well as internet operations for The Garden Island’s website. Before moving to Lihue, Stein began his newspaper career as the Graphics/IT/Website director for The East Oregonian in Pendleton, Ore. In Lihue, Stein and his crew work hard at staying on top of the quickly developing internet technologies as directed by the parent company, Lee Enterprises. Stein began his printing career as a customer service representative for Century Publishing in Post Falls, Idaho. He is a graduate of the University of Idaho with a degree in Fine Arts and Graphic Design. Richard Stein experienced a special dimension of journalism’s power in a rodeo ring in Pendleton, Ore. He was videotaping the annual rodeo for his newspaper’s website when he realized he was an eyewitness to once-in-a -lifetime events -- events he could share with his community through journalism.